What is an HVAC system? Alamance Oil gives you answers. The term HVAC is as common as it is ambiguous. While many people use the term, not many know what to consult an HVAC Company in Burlington, NC for. Whether it is Greensboro, Burlington, Reidsville or indeed any other place in North Carolina, the South, or entire country, the term HVAC is often misunderstood. The abbreviation HVAC universally stands for heating, ventilation, and air conditioning systems. Commercial as well as residential environments use HVAC functions to maintain the temperature of the interior section of any structure, home, or business. Most buildings and stand alone homes that you see will have an integrated HVAC system installed. While there are many functions that a Burlington, NC HVAC system serves, the primary function is to maintain a comfortable temperature in every room of a home or commercial building. This is done by the regulation of humidity, air flow, as well as temperature so that these parameters stay within acceptable limits. While this makes staying indoors comfortable, it also helps to ensure that inhabitants do not suffer from health risks. Heating: HVAC serves the function of heating and in this area of the country, this really could be the difference between life and death. When it is literally freezing outside, you need a system that keeps you warm and if it does well, then all the better and that’s what a good HVAC system does. Heating can be achieved through local as well as central heaters. Central heating systems tend to be more cost effective and are made up of furnaces, heating pumps, and radiators. Alamance Oil is a reputable HVAC company in Burlington, NC. We can help you decide which is more cost-effective for your home. Ventilation: The V in HVAC stands for ventilation which pertains to the movement of air in the home. Controlling the air flow allows the cleansing of the atmosphere indoors so that unnecessary carbon dioxide can be carted out and the oxygen let in. Not only does this aid breathing but it also aids in the prevention of air borne diseases and allergies. An effective ventilation system installed by a skilled technician at Alamance Oil is the best way to impede threats such as excessive moisture which can provoke and fuel the growth of mold and mildew. 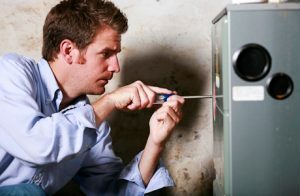 It is recommended to consult with a qualified and licensed HVAC Company in Burlington, NC for the installation of the right system as well as any ongoing maintenance that is needed. An HVAC system should last as long or longer as the large appliances in your home with the proper maintenance involved; and when in operation, they should be as quiet as a ceiling fan. Call Alamance Oil today for your HVAC needs, (336) 226-9371.